What is the best way to take melatonin to get a good night's sleep? For a broader look at supplements for sleep, as well as prescription drugs for sleep, see the Insomnia article in the Natural Products Encyclopedia on ConsumerLab.com. Also see our product review of Valerian Supplements -- which may have a calming effect; our information about L-tryptophan -- which can increase sleepiness and is used by the body to produce melatonin; and a question we answered about L-theanine, which may, interestingly, enhance the sleep quality and improve alertness during the day. I find taking only 1mg of Melatonin works much better than 3mg. And the fact that its liquid, so I don't have to drink water and then have to get up later to use the restroom. I take a very low dose lozenge of melatonin nightly and also take baby aspirin and toprol xl at bedtime. 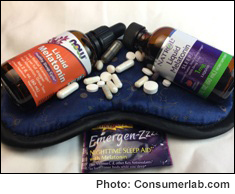 I am bothered by the fact that Consumerlab does not recommend extended use of melatonin. Eliminating it after a few short weeks would bring about a return of the original sleep issues, would it not? Is it really an issue to take melatonin in a low dose on an ongoing basis? Can it really be more problematic than taking a prescription sleep aid? Unfortunately, there are not yet good safety studies on the effects of long-term continuous use of low-dose melatonin. So, for now, it's advisable to use for shorter periods. There is a definite concern, however, with high-dose continuous use, as discussed in the Review. Thanks for your reply. I rely on Consumer lab for accurate and honest reviews. Are there other non-liquid sleep aids that might be safer to use on an ongoing basis? Have to avoid things like tea in order not to have to get up at night. I do take magnesium but it does not seem to help as much as melatonin does. There are other supplements, as discussed here: https://www.consumerlab.com/answers/which%2Dsupplements%2Dcan%2Dhelp%2Dme%2Dsleep/supplements%5Ffor%5Fsleep/. However, if you find that you need something all the time, it would seem best to consider lifestyle changes that may promote sleep. I hope you will keep us apprised of ongoing research into sleep-inducing supplements. I have made all the requisite "lifestyle changes" to no avail. There are many of us out there who have tried to find a safe solution through supplementation. I have read the link you provided but I find it amusing that every single supplement mentioned attaches a caveat that begins with "although." We will, Lida. There are no perfect supplements for sleep -- lots of caveats. I find a 3mg dose more effective than a 5mg dose. Also, taking too much can often effect sleep the next night or two...like the body is waiting for another injection of melatonin to get to sleep again. I also was prescribed trazodone 50 mg for insomnia (along with my ongoing doses of clonazepam 1 mg and melatonin, 3 mg), and after a couple of months developed severe nighttime urinary incontinence (ruined a mattress!). Went to a urologist who had no idea why. When I realized it started shortly after adding the trazodone, I stopped it and the incontinence stopped. I have tried adding it back twice since then, to be sure whether it was really causing the problem (and because it was so helpful for sleep) and each time, after a few weeks, the incontinence recurred, and then stopped after discontinuing the trazodone. This is just an FYI for people with chronic insomnia who are given trazodone and develop nighttime urinary incontinence after a few weeks. Try stopping the trazodone! Your doctor probably won't know this, and it's not obvious because it doesn't happen right away. I was prescribed trazodone also for insomnia. It only took 4 days for incontinence to strike. Quit it immediately, and have been fine ever since. I have been taking melatonin for about 25 years with no side effects. I found the lower dose of .5 mg from Trader Joe works better than the 3 mg I took previously. Hope there is no long term damage to me from melatonin. It makes me sleep 8 hours very well, and when I wake up during the night I can go back to sleep. Thank you! I've taken Jigsaw Melatonin for years (3mg) and no Jigsaw Health has discontinued making it. Am quite disturbed and am looking for another source. I'm 72....maybe I'm old enough not to have to worry about things. I am a retired neuroscientist, reading very widely beyond "specialty" areas. I take 20 mg melatonin nightly. Not to aid sleep but to compensate for possible deficiency of endogenous production, taking advantage of melatonin's anti-inflammatory effects. Yes 20 milligrams [not micrograms]. Life Extension does not hesitate to say 5 of its 10mg capsules would be OK.
P.S. I have no conflucts of interest. I also take a large dose of melatonin (60 mg per night). I started at 3 mg, which worked for a while, but every month or so I have to increase by 5 mg because my tolerance increases. This happens with all the rx sleep meds I have tried. I don't take anything else right now besides Trazadone 500mg at hs. I have had no side effects from either drug. Hi Jennifer- Please be aware that it is an extremely large dose of melatonin that you are taking, and it would not seem advisable. You may want to talk to your physician about your sleep problem. I find that 1/4 of a 3mg dose or 3.4mg gives me a good night's rest BUT there is a slight stupor the next day. START LOW! I have had reaonable success with 300 mcg time release by Life Extension. However, i sleep very well when I take Garden of Life Relax & Restore Whole Food Magenesium (original). I have been taking 3mg of melatonin for about 10 years. I became concerned because it is a hormone. So i began taking 1 mg and found that is works better that the 3mg. Thank you for sharing your experience using a lower dose, Anthony. As noted in the "What to Consider When Using" section of the Melatonin Supplements Review (https://www.consumerlab.com/reviews/_/melatonin/#using), it makes sense to try a low dose and see how it works. My physician, who is conventionally trained but is now an alternative (plus conventional) physician suggested a 1/2 mg. dose of melantonin. He said it was probably more effective. Like you, I found this (substantially lower, in my case) dose to be more efficacious. I too take Melatonin for sleep and use the very small dose of 1.5mg. In addition, I only use it every other night or every third night so as not to gain a dependency on any one product. The other ones I use are a valarian tea I make from the root, and the other night 1/8 tablet of Somnium. I have medical issues that are ongoing and I find this system is the gentlest and most effective way to aid in my quality of sleep for my particular needs. Much PTSD from combat actions. I had been taking Tamazapan, Trazadone and prozac all prescribed by a VA MD. Still, I couldn't get quality sleep and was tired everyday. A different MD stopped all 3(difficult to do)-I now take Melatonin 1mg or 3 mg and I'm much better and much safer! No more bad bad thoughts. Thank you for your service, George. I'm glad you got off the prescribed medications. I am in the process of weening myself off clonazapam and it's a long process. Another very effective and pretty benign drug for PTSD is Prasozin. It a mild blood pressure drug but when used at low doses right before bed it is highly effective in eliminating nightmares and other activating responses during sleep. Its use was pioneered by the VA and it is now widely used to treat night time PTSD symptoms. Thank you for your service George. Glad the new regime is working. There is much research on PTSD, including using an exercise called TRE, you might google it. I've seen it in Iraq war vets for stress with success. Walter Reed is studying it. Pioneered by David Berceli, PhD. Best of luck. I usually have no problem going to sleep around 10 pm. However if I am not sleepy by 12, I will take one. At first I was taking 3mg, but I found this very low dosage 300 mcg by Sundown and found it actually works better.. It is very small and dissolves quickly. Thank you for posting. I did not know about this product. I have been cutting my 1mg tablets into 1/4. This will be so much easier. I assume you are using sublingual tablets. I do this too , inserting 1/4 tablet under the tongue after swallowing a 100 mg capsule of L-theanine,and then lights out. Works like a charm for me. And if I do wake up during the night, I repeat the process. This is Chuck submitting a second test. I have been using melatonin of different brands and dosages. Remarkably the best working by far is Trader Joes 500mg dosage pill. It is chewable and I have talked to a number of people who agree it is the most effective melatonin out there. Over the last few years I've had more and more prone staying asleep. I have tried numerous other medications in combination and at different dosages. I've tried slow release / fast release melatonin / various other natural supplements and found that a product called "serene dream" which has a variety of products made it possible for me to fall back asleep but I would still wake up. The final discovery I made was Tylenol. I noticed that Tylenol works. It doesn't work by reducing pain. Pain has nothing to do with it. It somehow relaxes or works with the melatonin to extend the sleep. Using these supplements in combination consistently gives me 7 or 8 hours sleep every night I do it. It has taken years of experimentation to find and test this combination. I hope somebody benefits from this. Thanks for sharing your experience. Be aware of potential side-effects of long-term use of Tylenol and that the effects of long-term use of melatonin have not been well studied. 500 mg of melatonin is a HUGE dose. I take 6 mg which some say is a large dose. Hi John and Joe - It looks like the product John is referring to is sold in a dose of 500 micrograms (mcg), which would be 0.5 mg. Isn't 500 mg a big dose? Hi Mary - Yes, please see our response above. The product referred to provides 500 mcg, which is 0.5 mg. I have found the same results as John11148. Trader Joe's chewable works the best for me as well. And I like the fact you can take a smaller dose. I have had the same experience. This is a very LOW dose, half a mg. If I let it dissolve in my mouth, I fall asleep faster. If I chew and swallow it seems to affect how long I sleep. If I wake up in the middle of the night, either I listen to Podcasts or I take a portion of a pill (1/4 or 1/2) and then I go back to sleep again. I have wondered if there is something else in the Trader Joe pill that it works so well. I'm a 80 year old, 6 foot tall, 200 pound man and I have been taking Melatonin for twenty years - I.E - whenever I have difficulty falling asleep. I take a 2.5 mg dose but I don't swallow it; I use the SUBLINGUAL type which I dissolve under my tongue. It's pleasantly flavored and works VERY rapidly when taken this way. Usually sleep right through the night and I don't experience any drowsiness, etc. the following day. I've recommended it to several of my contemporary friends and they all swear by it. While I'm sure this remedy would not be the solution for everyone: I was a news junky until this past Christmas when I just didn't have time to watch and read lots of news. I still looked at the headlines and some facts about some news stories. Suddenly I found myself sleeping through most nights for the first time in YEARS. Even when I woke up in the middle of the night, I easily went back to sleep! This good sleep has continued even though Christmas is over and I am back on my regular routine and continuing my cut back on listening/reading the news. My life is stressful and I have trouble falling asleep. I tried melatonin but it left me groggy and tired the next day so I stopped taking it. My physician suggested that I was taking too large a dose (10mg) and she started me on a .5 mg dose (half a tab of the 1mg) intending to increase the dosage gradually to find the optimum amount for me. Incredibly, it worked like magic! I've not had any side effects, and I've not upped the dosage one year later. She, too, mentioned that it is a hormone and should be started with a tiny dose. Melatonin has absolutely no effect on me. I have tried different brands and different doses. Nothing. My insomnia is irregular and infrequent so I tough it out. Sometimes it's a matter of not being able to fall asleep and sometimes I wake up in the middle of the night but usually can fall back to sleep after a few hours. If I really need a good night's sleep because of some important scheduling the next day, I take a Zolpidem which works every time and I don't use it more than once every few months! Melatonin causes me to abruptly wake after a couple of hours. I found that taking Seriphos (much better for producing Seratonin) with Melatonin 1 hour before bed gives me a good long sleep. I took liquid Melatonin for years but it build up in my saliva glands and the adrenals had to work very hard to overcome the "sleep" state. Timed-release melatonin has been the most effective for me. I've been using it for 2 years now. Dorothy, as someone on here already mentioned, taking two kinds of melatonin, one for falling asleep and one for not waking up in the middle of the night is the best thing. That is what I do,but someone on here said she had something that does both ! Regarding the comment that melatonin gives nightmares to some, I agree but didn't realize it was the brand I had used for years that was the culprit until my daughter told me to try a different brand, and yes ! Same good sleep and no nightmares ! The best luck I've had with Melatonin is a dual-release type of tablet that has both a faster acting outer shell of the pill to get you to sleep faster, along with a delayed release component that helps keeps you asleep through the night. Type in "dual release melatonin" into any search engine or at your favorite supplement provider's search box. I agree with this advice. Dual-release worked best for me since my main problem was waking in the middle of the night. I've been taking 10mg of melatonin in pill form for several years, and before that, I took a lower dose for even longer. I'm post-menapausal, so I don't have to worry about it screwing up my periods. The only side effect I've experiences is 8-9 hours of peaceful sleep. I started taking it because I wasn't getting enough sleep, and I was dangerously tired during the day. I was making stupid decisions because I was too tired to think straight. Then I fell asleep at the wheel with my toddler in the car, and woke up just in time to prevent a bad accident. I tried getting more exercise, and eating a carb-rich dinner. It didn't help. OTC sleep meds either didn't work or left me groggy the whole next day, as did Rozerem. I tried Benadryl, but it has the odd effect of making me drowsy but unable to sleep. My doc refused to put me on Ambien. So I said, "All right then, I'll try melatonin." It worked a treat! I continued taking it when my daughter was in high school because I had to get up about 2-3 hours before my body wanted to wake up, and I never got used to the new schedule. My daughter had the same problem, and we even took her to a sleep clinic, but the doc there just said, "School starts too early (7:25am in my town). Arrange for her to have a study hall first period so she can go in an hour later." That didn't work, but when she tried melatonin, it gave her nightmares and didn't help her sleep. So everyone is different, I guess. You might have sleep apnea. Get a sleep study. I would also take into consideration how much she is looking at electronics, cell phones, computers, TV's, etc...It's pretty well documented the blue light emitted from the screens of todays devices reduces the production of melatonin production and may play a significant role in disruption of a normal sleep cycle. The light goes into the eyes, then affects the pineal gland in the brain which plays a role in melatonin production. Ask your doc about it or google it. Hope that helps. Is there any harm in taking melatonin every night and how much is too much? Hi Nan - Melatonin appears to be safe when used short-term (less than 3 months) but there are few studies on its long term effects in healthy individuals. Because melatonin is a hormone, it's best to use the lowest dose that helps you to sleep. There is some evidence that taking melatonin can affect the metabolism of other hormones in the body, and interact with certain medical conditions and medications. Please see the Melatonin Review (https://www.consumerlab.com/reviews/melatonin-supplements/melatonin/#using) and the Encyclopedia article on melatonin (http://www.consumerlab.com/tnp.asp?chunkiid=21811) for more about dosage and potential side-effects. Diane 602: I took trazadone for 6 years. When I decided to stop, I went through horrible withdrawals for weeks. The doctor confirmed it was due to the trazadone, but he had failed to mention this to me when I started taking it. Something you might want to keep in mind. I had that problem for many years. One doctor recommended 50mg of trazodone before bed. I've been doing that since about 1992. If I forget to take it, I'm up at 2AM no matter where I am or how much exercise I've gotten that day. That correlation is 100%. I got an app on my IPhone- insomnia cure and when awake at 2am I listen to it. Sometimes it helps to fall back to sleep. I have no problem falling asleep - often it is quite early and I would prefer to wait. But the real problem is falling asleep early then waking about 2 a.m. and not being able to go back to sleep until about 5 a.m. Do you have any suggestions about what to take? Hi Dorothy - The most natural approach would be to try to stay up a bit later -- that is, don't go to sleep too early. It's not clear if a timed-release melatonin would help you, but you might want to try that on a short-term basis. I have found that a glass of warm milk - even cold milk - helps me get back to sleep when I awaken in the middle of the night. It gives me high quality sleep, too. On Melatonin I was waking up in the morning with a bad headache. I tried Benadryl. It made me so drowsy the next day that I could not function. I was on Ambien (5mg) for several years with no problems (maybe taking it once or twice weekly). It worked nicely. No morning drowsiness. No doing "things" in the middle of the night like driving around the neighborhood (that is a known side effect) of Ambien. However, my doctor refused to renew the prescription for Ambien (I assume that he was fearful of the DEA as it is a controlled substance). So, what do I do??? I do have a sound machine that seems to help with sleep. Hi Jerry - As noted in the "Concerns and Cautions" section of our Melatonin Review (https://www.consumerlab.com/reviews//melatonin/#cautions) headache has been reported as a side-effect by about 8% of patients given melatonin in clinical studies. Out of curiosity, what dose of melatonin were you taking? Products range in strength from about 0.3 mg to 10 mg. You may want to try a low dose, as that can be effective. I have used several strengths & types of Melatonin - each and every time I get terrible headaches and nightmares. Melatonin is NOT for everyone! Respect your body. I was taking melatonin until I developed a shaking sensation throughout my entire body. I thought I was developing Parkinsons. I quit the melatonin and the shakes went away. I have Hashimotos disease and am extremely sensitive to all drugs and supplements. This CL Answer initially posted on 3/10/2015. Last updated 8/4/2017.